What’s better than cinnamon rolls? Cinnamon rolls with apples and caramel sauce, of course. I love cinnamon rolls and the moister, softer, and gooier they are, the better. This recipe delivers big time. It’s one of the best things I’ve made in ages. Seriously. The gooey factor of a Cinnabon plus apples and caramel sauce. The recipe is easy, ready in 30 minutes, and you don’t even have to make scratch cinnamon roll dough. I used two tubes of refrigerated cinnamon roll dough, chopped it into pieces, poured a milky egg mixture over the top, before adding apples, frosting, and caramel sauce. As the dough rises around the apples, the apples become trapped in the dough, and every bite is filled with tender, juicy apples that retain a tiny bit of crunch. A perfect contrast to the chewy, buttery dough. 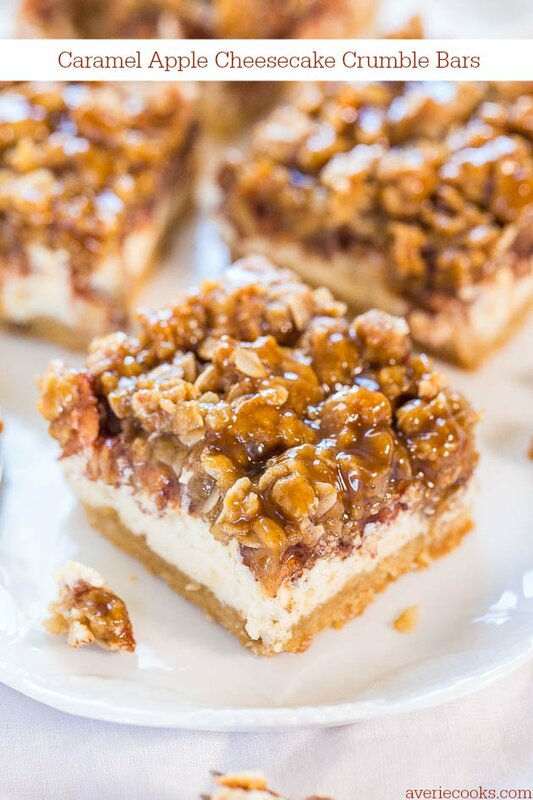 After baking I added frosting and drizzled salted caramel over the top for an added boost of caramel flavor. Use homemade or storebought. You can always add ice cream or whipped topping if you’re feeling extra decadent but this is a decadent recipe already and we didn’t need ice cream. 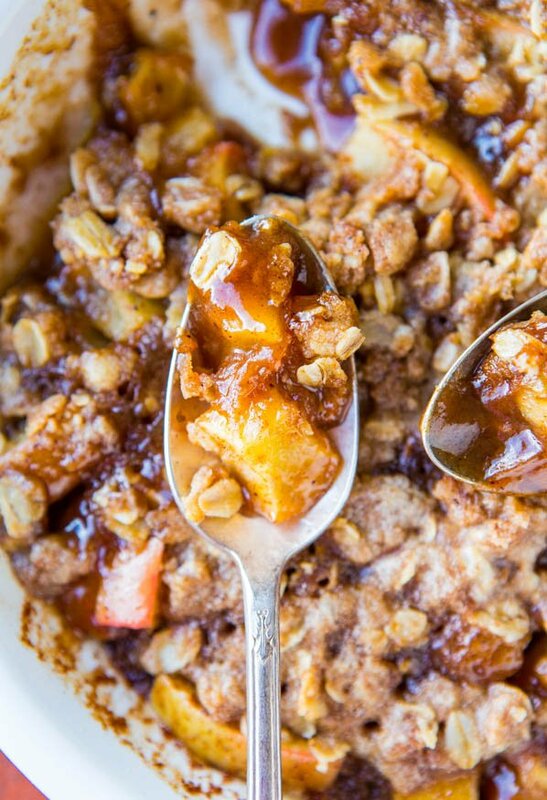 During baking the apples release juice and there’s a saucy, juicy, caramel mixture at the bottom of the pan that’s so incredibly delicious. 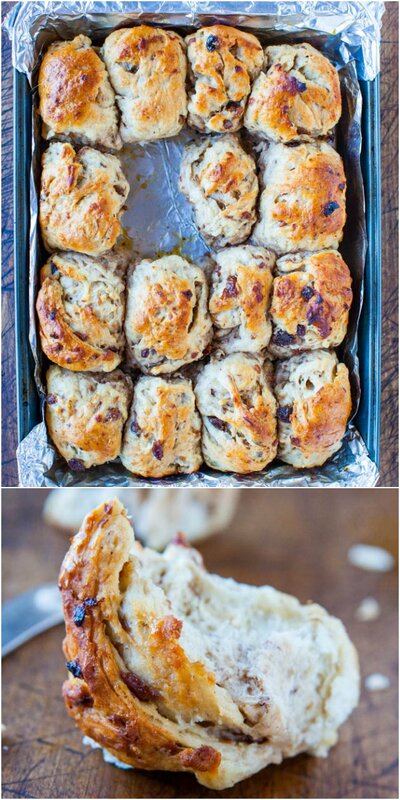 The recipe is perfect for lazy weekend breakfasts, impromptu company, or a special holiday brunch or event. It tastes like you slaved over it but no one has to know you didn’t. 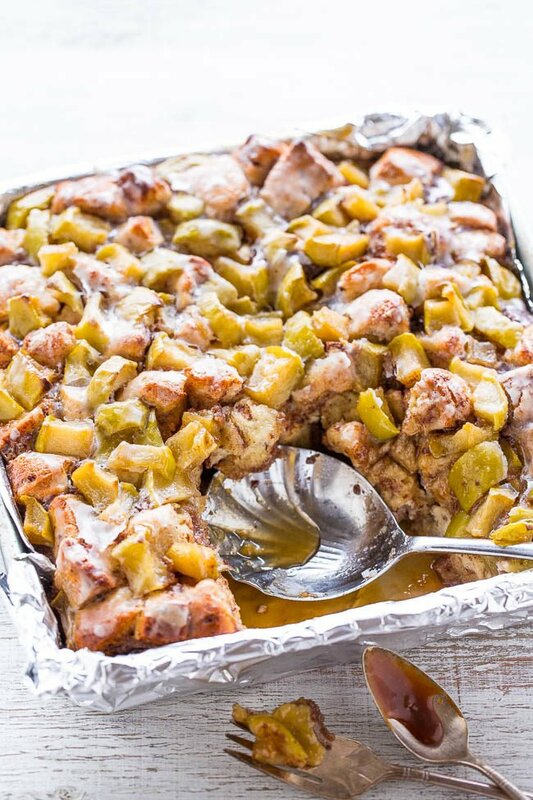 This cinnamon roll recipe with apples and caramel sauce is easy, ready in 30 minutes, and you don’t even have to make scratch cinnamon roll dough. 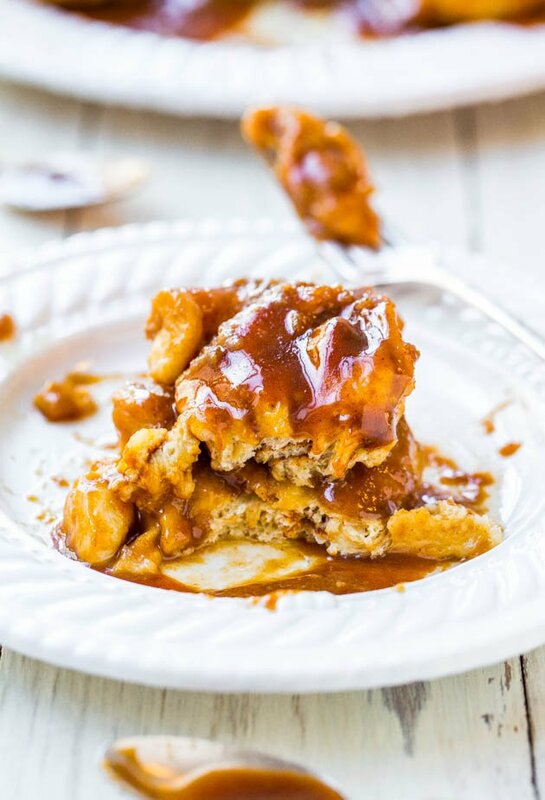 Use two tubes of refrigerated cinnamon roll dough, chop it into pieces, pour a milky egg mixture over the top, before adding apples, frosting, and caramel sauce. As the dough rises around the apples, the apples become trapped in the dough, and every bite is filled with tender, juicy apples. A perfect contrast to the chewy, buttery dough. 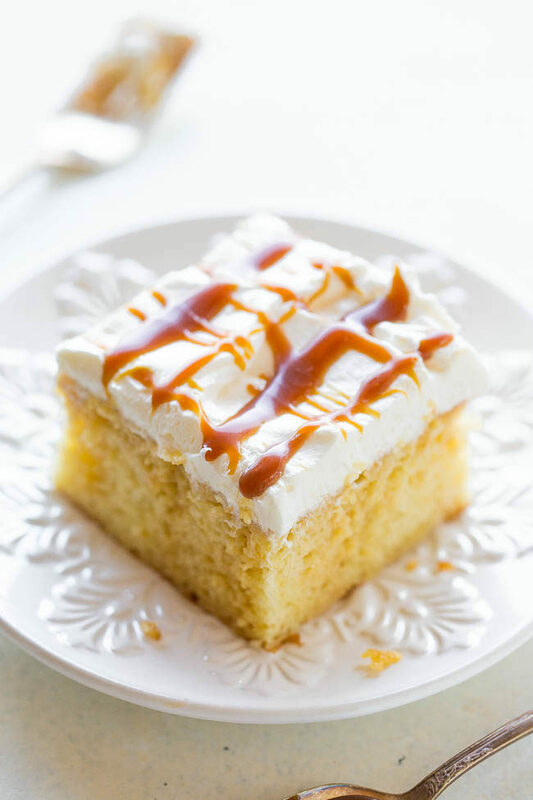 After baking add frosting and drizzle salted caramel over the top for an added boost of caramel flavor. 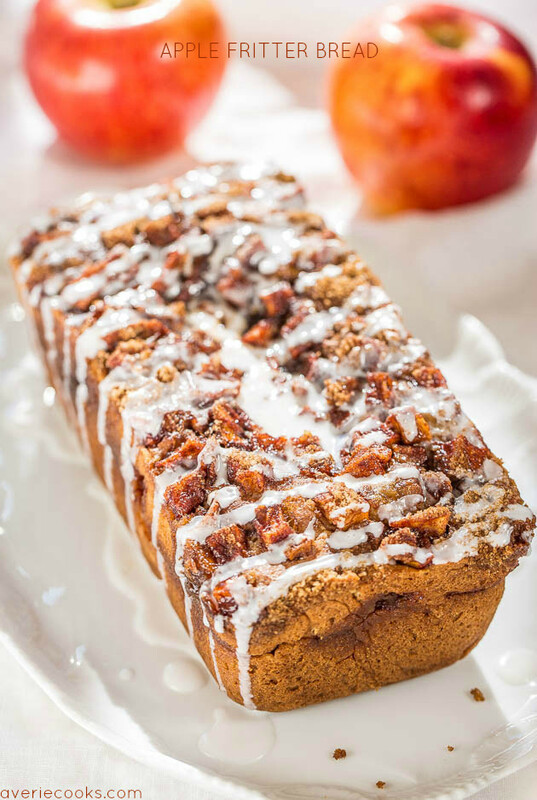 Perfect for lazy weekend breakfasts, impromptu company, or a special holiday brunch or event. Preheat oven to 375F. Line a 9×9-inch pan with foil and spray with cooking spray; set aside. 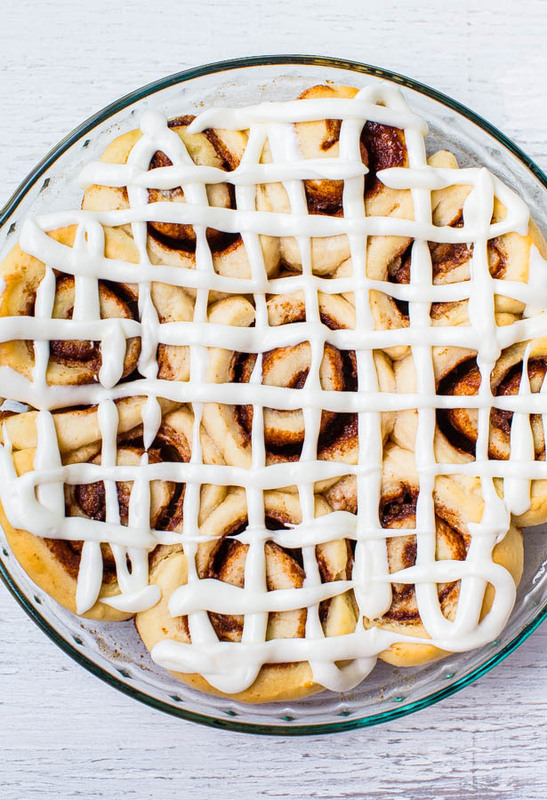 Cut the cinnamon roll dough into 3 even strips, then cut those strips into 3 pieces, making 9 pieces total per cinnamon roll. Scatter in prepared pan, separating the pieces from one another because they stick together if you slice them in stacks; set pan and the icing from the packaging aside. To a medium bowl, add the eggs, 1/2 cup milk, cinnamon, vanilla, salt, and whisk until smooth; set aside. To a large skillet, add the butter and heat over medium-low heat to melt. Add the apples, brown sugar, and cook over low heat until the sugar starts to caramelize and thicken, about 10 minutes; stir frequently. Remove pan from heat; set aside. 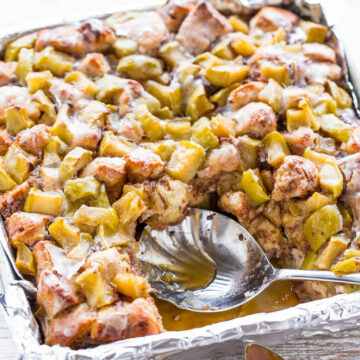 Pour the milky egg mixture over the cinnamon rolls, top with the apples and all the caramel sauce in the pan, and evenly drizzle the icing. If the icing is cold, heating it in the microwave for 10 seconds will make drizzling easier. Place pan on a baking sheet (insurance against overflow and highly recommended) and bake for about 30 minutes, or until the top is set in the center and lightly golden brown. Place pan on a wire rack to cool momentarily while you make the frosting. To a medium bowl, add the confectioners’ sugar, 2 tablespoons cream or milk, and whisk to combine until smooth. Evenly drizzle the frosting and the salted caramel over the rolls, and optionally serve with ice cream or whipped topping. Serve immediately. Cinnamon rolls are best warm and fresh but will keep airtight at room temp for up to 5 days. 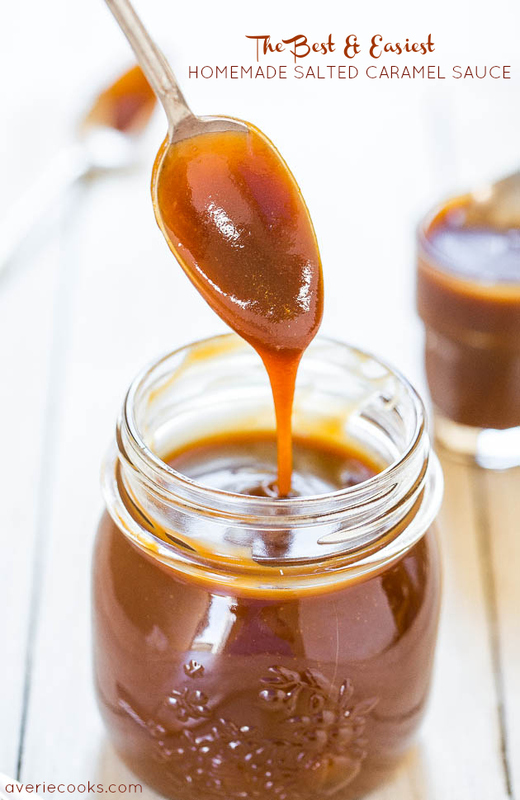 The Best & Easiest Homemade Salted Caramel Sauce – Ready in 15 minutes and tastes 1000x better than any storebought sauce ever could! Salted Caramel Sticky Buns – The easiest stickiest buns ever and ready in 30 minutes! 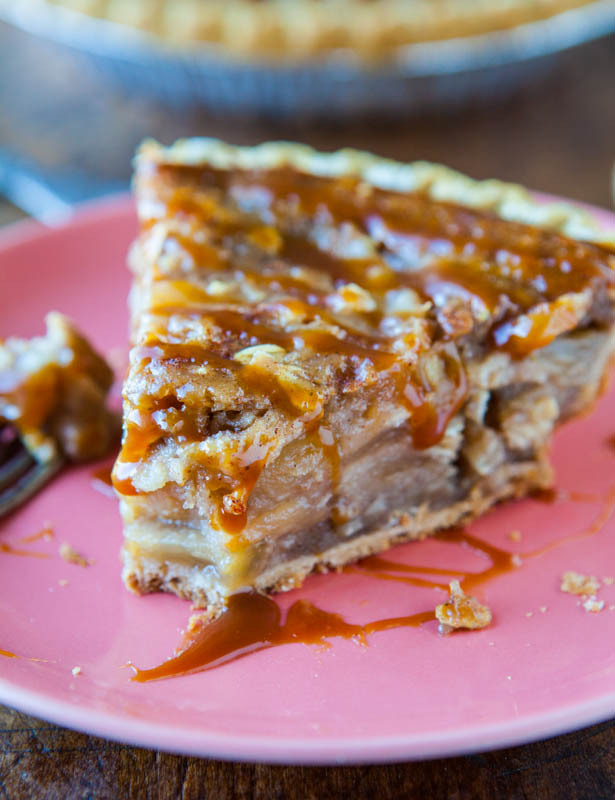 Drenched in salted caramel for maximum sticky-ness! 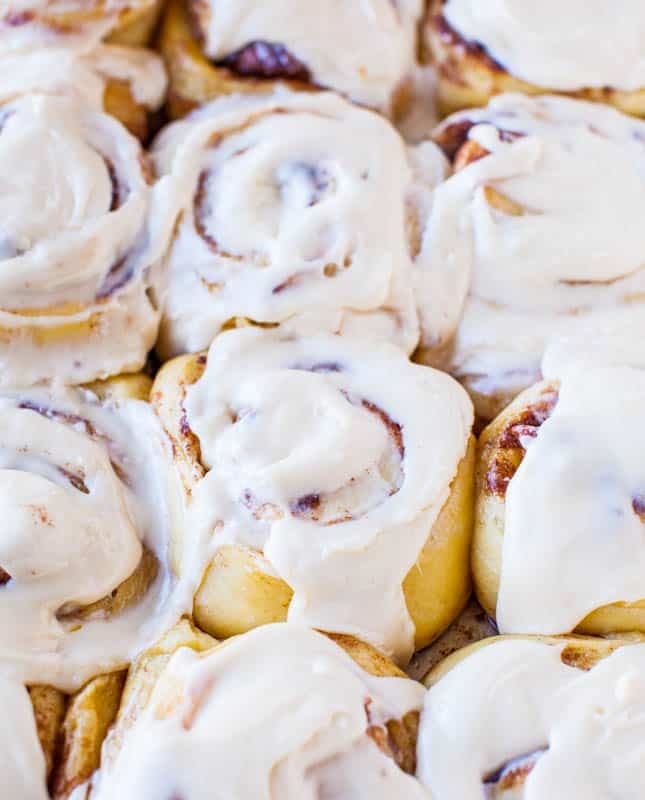 Overnight Buttermilk Soft and Fluffy Cinnamon Rolls – For soft, fluffy, pillowy, perfect cinnamon rolls when you need a larger batch, it’s my go-to. Readers who’ve tried it write with high praise and success! 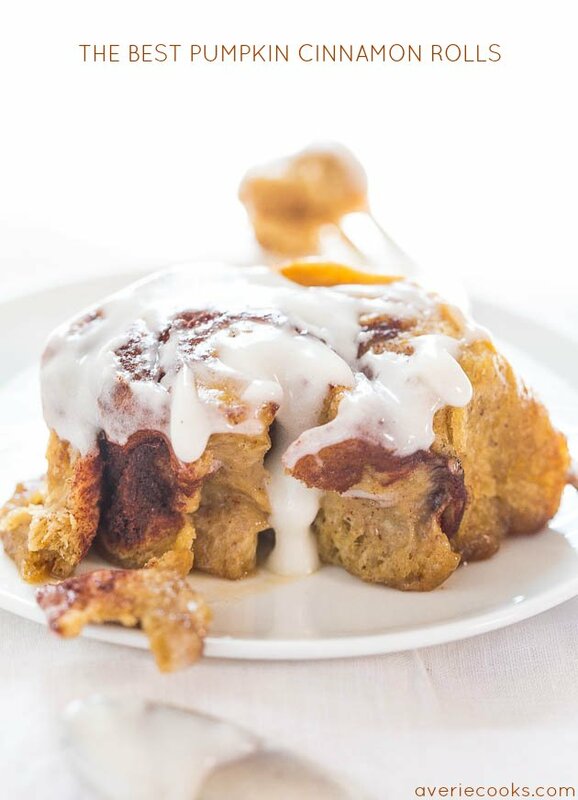 The Best Pumpkin Cinnamon Rolls – Super soft, fluffy, and topped with a cream cheese glaze! Move over Cinnabon, these are better!! 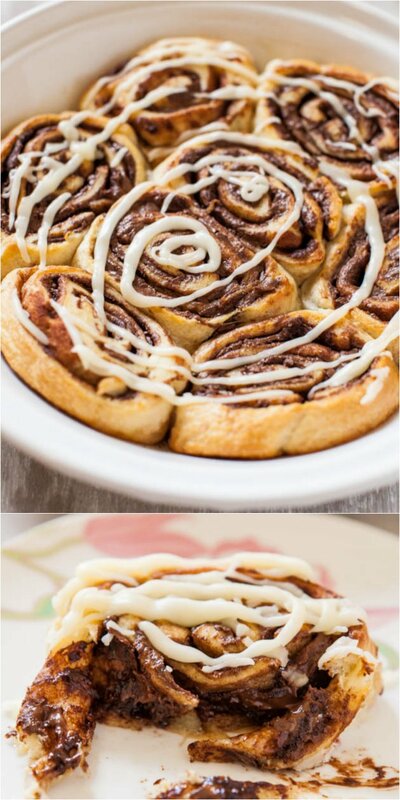 Nutella Cinnamon Rolls with Vanilla Glaze (Shortcut Recipe) – A can of crescent rolls never tasted so good as when they’re stuffed with Nutella and rolled up. Ready from start to finish in 15 minutes! 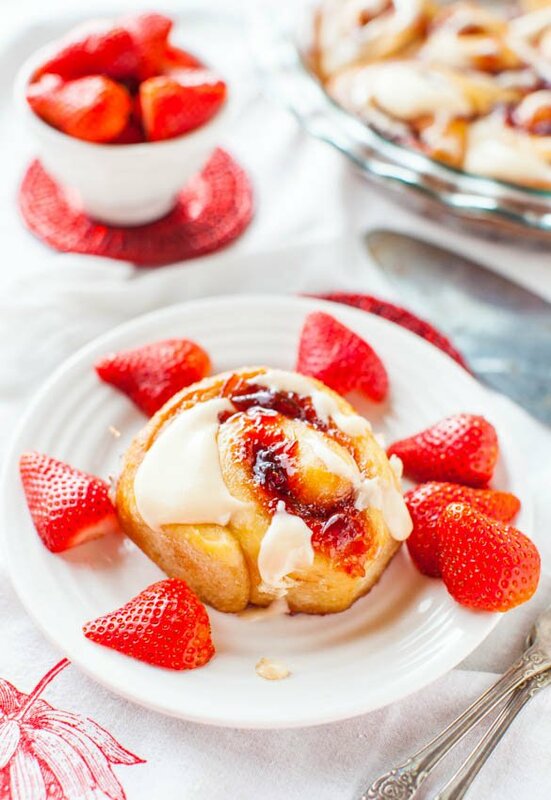 Strawberry Sweet Rolls with Vanilla Cream Cheese Glaze – Soft, glazed rolls filled with sweet strawberry jam! Healthy Oatmeal Raisin Rolls – A healthier spin on cinnamon rolls, these soft and chewy rolls are made with healthy oats and brushed with honey! Wow. This is THE fall party dessert. I can’t wait to serve it to mobs of screaming fans! And using salted caramel sauce is definitely the way to go. It’s so much better that way! You will definitely have a mob of screaming fans after this one! So, so good. One of my faves in a long time! 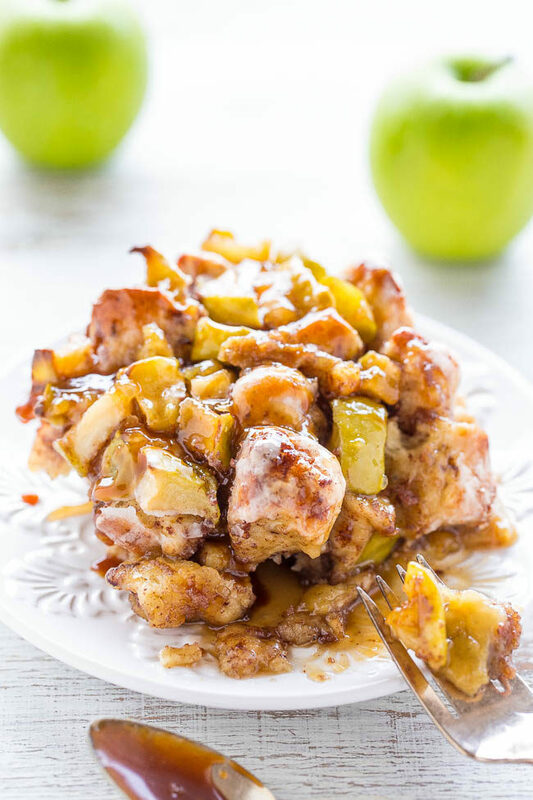 This is a nice marriage of apple pie and cinnamon roll and it does look decadent! I rhink the granny smith apples would be a nice balance to the sweetness of the frosting and caramel sauce. This sounds so good right now! I LOVE these flavors all year round! You know I’m ALL OVER THIS!!! LOVE. I had a GF cinnamon roll on the way to my hike yesterday and now all I want to eat are cinnamon rolls all day long, every day. But at $3 each, I need to make them myself, and that seems like a lot of work…which is probably better for my waistline. $3 each I think is a value in CA! I took Skylar for a small Pinkberry today (fro-yo) and it was 4.95 for the smallest cup ever. Toppings included but still. A black iced coffee at Starbucks is $3 bucks too. But anyway, glad you found a GF cinn roll! That’s great! This looks ahhmazing!! I’m thinking it would be easy to make a gluten free version of this, right? Anyway, this gets me in the mood for fall too! So over this heat!